Ever wonder what happened to Jack, Sarge, and Santo? All survived unimaginable situations, but where are they now? Check out the updates on three of our most memorable dogs from the past year. Jack was the victim of medical neglect so severe, his owners are being prosecuted for animal cruelty. Read Jack’s full story here. Update: Jack underwent two surgeries, the first to amputate what was left of his deteriorated right front leg, and the second to treat the resulting infections. After a slow and uncertain recovery period, Jack the Heeler is thriving. He remains in foster care, but the Espanola Valley Humane Society is now accepting applications for his adoption. Hooray, Jack! Check out moving footage of Jack, moving around just fine. Santo arrived at the Santa Fe Humane Society desperately skinny and with a horrendous case of Demodex (parasitic mange). Read Santo’s full story here. Update: During his weeks in a loving foster home, Pit Bull Santo proved himself a true saint: affectionate and eager-to-please with people, and easy-going, gentle, and playful with other dogs. Last month, Santo was adopted by a young Santa Fe area family. He now lives with his new sister (another recently adopted Pit Bull) and three humans in a large house with a big yard. 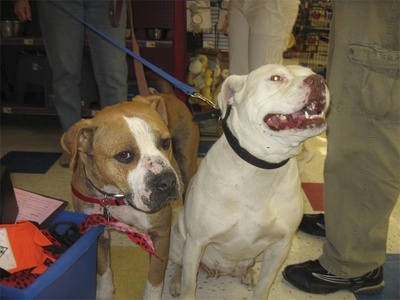 Santo on the left with his new sister. 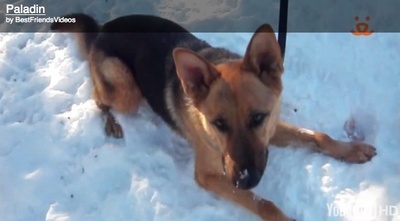 Locked in his small cage, a German Shepherd named Sarge was shot multiple times at close range. As the dog howled in pain, his owner continued firing. Read Sarge’s full story here. 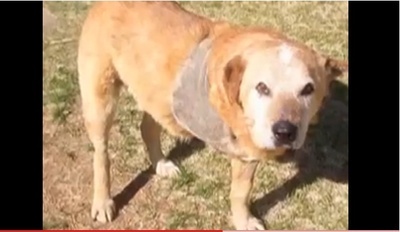 Update: Sarge now lives at Best Friends Animal Society in Kanab, Utah. He’s been given a new name — Paladin — and is learning to once again trust humans and enjoy life. His former owner, Lawrence Mick, was convicted of animal cruelty and served a short sentence in an Ohio corrections facility..
Sarge, now Paladin, works with specialists at Best Friends.